Well 2009 has come to an end and my retirement nestegg is at an all-time high. Despite things being so horrible and everything being in shambles with the economy my retirement nestegg grew 76% this year and to be honest other than these reports I barely noticed or barely cared. In fact I am to the point now where I can go a month or more without even looking at a stock market ticker or knowing whether the market went up or down, and to be honest I think this is a really good thing. I’ve learned a lot over the past 4-5 years – I had lots of fun seeing my nestegg grow and my stocks jump or fall 20% or more in one day, but now after a few years I’ve realized that day to day, month to month, or year to year fluctuations really don’t mean anything and its just a waste of time to follow or care about them. I did my few years of homework and learned tons about personal finance and investing, put a plan together, and now I am in cruise control and can spend my time worrying about more important things like watching my kids grow up and working on my golf game. No amount of time and daily effort on my part is going to make a bit of difference on whether a stock or mutual fund of mine is going to go up or down or for me to try to rationalize why something went up or down. It simply does not matter. People who spend time doing this are wasting their time and probably hurting their performance, because well when you follow something so intently – you tend to take action – which is usually a bad thing. From now on I will create these monthly reports – well partly because I started them from the beginning and its fun to see how the month to month fluctuations mean absolutely nothing in the long term. From now on I will check my investments maybe once or twice a year and then pretty much forget about them and live my life – which in the end is the whole purpose of this investing game. 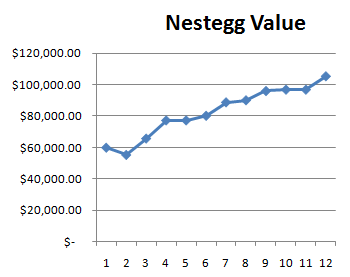 Anyway here is my 2009 year end nestegg report and a chart of its growth over 2009.